After 40 years, Knott’s Scary Farm is still going strong. Halloween Haunt celebrated 40 years on Sept. 21. 2012 as all the monsters, ghouls and witches came out to give Haunt fans a good scare. This year, Halloween Haunt has 12 different mazes and one VIP maze. The 12 mazes they have are new and a few have been brought back by popular demand. The mazes are Trick or Treat, Dia De Los Muertos 3D, Uncle Bobo’s Big Bizarre 3D, Virus Z feat. Carrie, Uncle Willy’s Slaughterhouse, Endgames, Evil Dead, Pinocchio Unstrung, Terror of London, Dominion of the Dead, Delirium, Fallout Shelter. TRAPPED was the VIP maze. Dominion of the Dead is a returning maze that was taken off years ago. As Halloween Haunt celebrates 40 years, this maze continues to scare people with its sweet and beautiful yet terrifying story and characters. TRAPPED however, is quite new to Haunt. It is a VIP maze and requires a separate fee from Halloween Haunt tickets. Haunt fans and their party will be “trapped” in the maze and face their biggest fears in order to get out of the maze. If you like to get scared and have fun at the same time, going to Knott’s Scary Farm 40th Halloween Haunt is highly recommended. It is not expensive and it obviously has people coming back each year so go experience it yourself. Just like they say at Halloween Haunt, see you in the fog. Universal Studios Halloween Horror Nights, however, is a different experience. 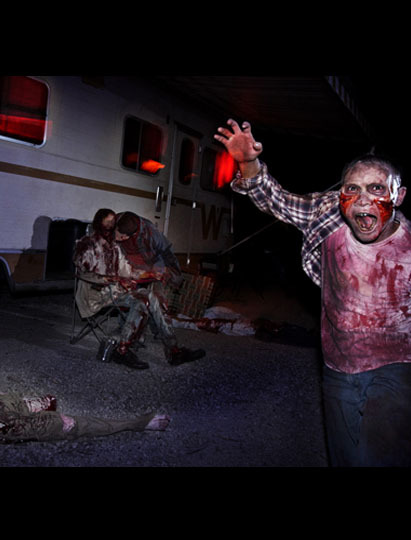 If you are looking for a good, scary time this Halloween, then why not try Halloween Horror Nights at Universal Studios? There are many reasons you should, including the horrifying mazes and attractions. There are gory scenes of the macabre everywhere you look. No matter where you go, you will shake in the wake of pure, unadulterated terror. Universal added the Silent Hill franchise this year in addition to the increasingly popular Walking Dead. If you want to see for yourself, be wary: this event is not for the faint of heart. The tell-tale warning at the front does not lie; it is indeed a spectacle of terror and carnage, not exactly recommended for those under 17 years of age. However, for the brave and bold, think nothing of it. Pick your poison. Are you scared of clowns? Psychotic, undead nurses? Zombies? If you picked any or all of the following, then maybe it’s time for you to pay a visit to Horror Nights with your family and friends. Go ahead and risk a scream-induced sore throat. Get ready for the thrill of your life, because “Once you go in, you won’t be able to come out”. It’s a Halloween event to DIE for.